Consult 2 Code (C2C) provides fast and accurate medical billing, coding and practice management services to healthcare providers of all sizes, including hospitals, clinics, home health agencies and health departments. 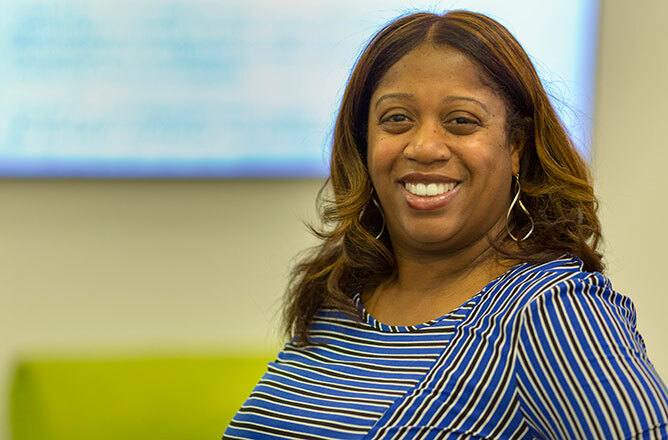 Angel Washington, who has more than two decades of experience in medical billing, coding and credentialing, founded C2C in 2008 to help her clients increase profitability while removing the burden of the billing process from their offices. Angel is also a part of JumpStart’s Core City: Cleveland Impact Program, an intensive business assistance program designed to support the development and growth of businesses located within Cleveland’s core neighborhoods. We recently sat down with Angel to discuss her business, her experiences in the Impact Program and her growth plans. In terms of what separates our business, we are really known as the medical billing ‘fixers.’ Most of our clients come to us with some sort of complicated issue that needs to be solved. They tell us their problems and we try to fix those problems, so we’ve become known as industry experts and often get called upon to certify that coding and billing has been done correctly. That gives us an upper-hand as a business. 2. How has the Core City: Cleveland program helped you so far? What have been the biggest takeaways? The program has been an invaluable tool for me as a business owner. We’ve been paired with advisors that sort of match the industry we’re in and that has been great. However, just being here has helped force us to focus ‘on’ our business, because we spend so much time ‘in’ our business. I’ve been able to focus on things I’ve just never focused on before because I was too busy. Just recently, I had some IT issues and I was able to work with one of the IT people at JumpStart to figure out the issue and find a consultant to help get those issues under control. It’s a competition, but it’s really more like a family. We all help each other and share ideas. When you say ‘competition’ you think it’s all about winning and beating the other people but it’s really not like that here at all. It feels like we’re all working together to make out businesses better. Whether I win the competition or not, I will still feel like I’ve won because I’ve been able to focus on my business in a way that I never would have otherwise. Get in your car and drive to JumpStart as soon as possible. There are so many resources here. It’s really a key nugget for the City of Cleveland to have a program like this that is offered for free to entrepreneurs. Within a year I plan to bring on some new employees to free up more of my time to focus more on marketing and sales to scale the business. So, within five years we hope to be a substantial employer within the City of Cleveland. Learn more about Consult 2 Code LLC at myconsult2code.com. Then, come watch Angel pitch her business live on December 5 for a chance to win up to $10,000 at the Core City Cleveland Entrepreneur Showcase.